HitmanPro is a commercial security solution for Windows that has been designed as a second line of defense against malware and other threats. There are different types of security programs that you can run on your Windows PC. Firewalls and resident antivirus solutions usually make up the first line of defense and while they are great at blocking the majority of threats before they can have an impact on the system, they are not perfect. Even a 99.9% detection rate means that 0.1% of all malware slips passed the defenses, and that's where your second line of defense comes into play. One of the programs that you can use for that is HitmanPro. What makes HitmanPro special is that it combines the malware engines of several security companies. The current version includes the engines of Dr.Web, Ikarus, G Data, Emsisoft and Bitdefender which improves the program's detection rate significantly in comparison to single-engine solutions. In addition, it does not rely solely on virus signatures but uses forensic methods to find files on the system that act and behave like malware. You can download a fully working 30-day trial version for 32-bit or 64-bit systems from the Surfright website. Just run the program on your system after the download has finished to use it as it requires no installation. You should see the main start screen afterwards (note that it may look different depending on version and date you run it). Click on Settings and there on the license tab to activate your free license. You need to enter an email address for that though. If you don't activate, the removal of malware is disabled. To scan the system click on the next button on the frontpage. If you click on the small arrow next to it, you can instead run a quick scan of the system or display early warning scores instead if you enable the expert option under settings first. Especially the latter option is a powerful feature of the program as it looks beyond signatures and checksums to analyze other program data such as the time it appeared on the system and its behavior. The program will ask you whether you want to install it on the system or use it for a one-time scan only before the scan proceeds. The program displays its findings after the scan in a results listing. Here you find the name of the file, its path, and classification listed. You also find the recommended action on the right which you can change, for instance from quarantine to delete or ignore, and also click on the show information link to find out more about the program or open its location on the local system. The border around the interface changes its color based on the threats found. Red signals that at least one serious threat has been found by the scan, while blue indicates that no threats have bee found. You can also access additional information by selecting an item in the listing. The winsrv.dll description for instance informed me that the file was only recently added to the computer and that it starts automatically with it. A click on next performs the selected actions. A lot is going on behind the scene when you scan a Windows computer with HitmanPro. Recent versions of the application detect all kinds of threats, including those that are annoying but usually not dangerous. This includes tracking cookies and potentially unwanted programs (PUPs). Before you scan you may want to check the program options as they provide you with settings that change scans and other parts of the program. The program will for instance upload suspicious files automatically to the scan cloud to test it on the Internet which you may not want the program to do automatically. As far as scans go, you can schedule regular scans here and define in detail what you want scanned and when you want the scans to be run. Scans can also be automatically prevented when a full screen application is running to prevent slow downs or other side effects. If you do have a Virustotal API key you can enter it in the options as well to include options to scan files with the cloud scanner as well into HitmanPro. A standard scan takes less than 2 minutes to complete which is really fast for a software of its kind. You find a couple of other interesting options built-into the program. You can for instance integrate a scan option into Windows Explorer, or use the recently released HitmanPro.Kickstart which we reviewed about a week ago. I suggest you check out our initial review of the feature for all the details. Only that much, you can use it as a means of recovery against ransomware attacks on your system that prevent you from accessing it until you "pay ransom". The program has been designed to restore system access by bypassing the ransomware's modifications made to the system. Another program that you may want to check out is HitmanPro.Alert from Surfright. It is a free program if you have a HitmanPro license that has been designed to protect Windows PCs against exploits. HitmanPro 3.7 is an excellent second opinion scanner for your computer system thanks to the integration of several anti-malware engines and cloud scanning technologies. The added Kickstarter option is a bonus that may come in handy when it is needed. Keep in mind that you can't use Kickstarter if you are using full disk encryption to protect your systems. The trial version is good for 30 days of scanning which may be interesting for you even if you do not plan on buying the program. The scan results may change your mind though. It is recommended to verify the findings of the program, for instance over on Virustotal before you make drastic changes to your system. But that recommendation is true for all security programs. HitmanPro is a must have addition to your security configuration.Whether you use the free version as an extra on demand scanner or the pro version.I highly recommend this software to add an extra layer of protection to your PC. Great software! In for one. humm, perhaps I will win this license! Great scanner. Perfect complement to anti-virus. I use this program in full version and i think is the best on this class :) Thank you for giveaway. Count me in, please. Great Software. Often Use it to scan ma PC. will be great to have a license. I would like to win Hitman Pro because it will provide additional protection for my pc and complement my antivirus program for extra security. seems a great add for sucuring a PC. Count me in, Martin! Great software. Many thanks for giveaway. Great scanner. Perfect complement to anti-virus. Fantastic!!! I use MSE and would really like to have a second opinion scanner. Was meant to try this one a few months ago when reading up on it over at wilders, but totally forgot. I like to get one hitman pro license. HitmanPro to świetny program. Byłbym szczęśliwy go posiadając. First of all I want to say Thank you for another cool giveaway. HitmanPro (Hitman Pro) is one of the best (if not the best) second opinion anti-malware Scanner, I’m using it and I’m loving it.HitmanPro is amazing fast, scan takes on my pc 2 minutesHitmanPro is light for system resources and much better than all other anti-malware scanners becasue HitmanPro uses 5 anti-malware engines to detect and kill malware. HitmanPro use GData, Emsisoft, BitDefender, Ikarus, Dr.Web engines + surfright own database.HitmanPro is cloud anti-malware scanner so it does not require daily database updates because all malware signatures ale in the cloud.Latest HitmanPro version has another gem, HitmanPro.Kickstart which will remove nasty ransomware infections from pc.Hitman Pro also removes tracking cookies, and people can use it without installing on pc, just download HitmanPro and run exe file, thats all. Thanks for giveaway and count me in. Great giveaway. Very good security app. Thanks for the contest. HMP is great. Awesome tool for rootkits. Thanks again for your great Tips folks. I’ve used hitman pro, and it is excellent. i would like to enter the contest may the luckiest one win! I used its trail version few days ago only once. It detect three malware in couple of minutes. At that time i have bitdefender internet security 2013 installed despite there was 3 infection in my pc. Although i didnot notice any change in my system becaouse of those malware, i don”t know how dangerous it was. but what impress me about this software was blazing fast scanning and cloud scanning technology. I thought it could be installed in my system in case of any kind malware attack in future. I am hoping this kind of giveaway to chance a win this reputed security software. i hope i may win one license for my pc. Great software, count me in, please. I use Hitman Pro free version on a periodic basis to supplement regular AV scanning, I could use a paid license. Please count me in for one. Love hitmanpro, i am using the free version from time to time to check my machine and usually when i try to disinfect friends computers. Thank you for this giveaway, please count me in. Interesting assessment on falling back to Hitman Pro as a second level of defense. Although Malwarebytes has for a long time now been my go-to infection removal tool, Hitman seems to do better with the odd ‘can’t get rid of’ infection. I haven’t had an chance (thankfully!) to try the newer kickstarter feature, but perversely look forward to an opportunity. How messed up is that? An excellent program. Required if you want to increase safety in the work on your computer. I use it for a long time. Might be good to examine. Thank for this giveaway! Hitman Pro is a topnotch application software in its categories would be nice if able to grab one here. Thank again. As I am constantly paraniod that I have some virus or malware I could definately make use of this app. Great review and giveaway. Please count me in. Thanks a lot. Hitman Pro – It has a very fast scanner and is effective. Count me too – please. Nice piece of software. Put collaboration into the good of all. This is a very good one. Thanks for this giveaway (and the others)! I want to win Hitman Pro. He’s got five on-demand scanners, Bitdefender, Emsisoft, Dr.Web, G Data and IKARUS. many people were impressed, as well as special software Hitman Pro. Great review, thanks. Count me in also. Currently using Win8 and I’m only using the windows defender at the moment. Would be great to get this and use as a safety check. This is a great giveaway and I have been looking for hitman pro license. Since I am unemployed I can not afford buying it to protect my pc and hopefully I can win a license. Great program… Would love to win a copy… Thanks for the giveaway ! Hitman Pro is a lightweight and efficient. I recently had the trial and this program to my liking. Regards. Thanks for another great giveaway and please count me in. Thank you for this giveaway and review. I would like to take a part in this contest! Hitman Pro I think could bq quite helpful for me as I tend to fix a lot of PCs almost every day, and having something else to help look for bad code could help quite a bit. Thanks for also alerting me about the product! I’ve been using HitmanPro for some time, but without the license therefore having to manually correct found problems. I’d be happy to continue with the license. Please count me in. Cool give away. Would love to win a license. HItmanPro is a great antimalware software. Count me in. Thanks. Most malware protection tools are great for clean up rather than prevention and HitmanPro is one of the better tools that i have used for this task. i am still waiting for that miracle software that can help my dad’s computer from getting into trouble. I wonder if this new version is up for the Challenge. Most effective malware , spywares removal engine . It is very light and blazing fast scanner . One of the greatest tool available in the market . Thanks for the cool giveaway. Please count me in. Thanks for the review. I’ll have to give this one a try on a relative’s computer they left for me to (once again) fix for them. power of the cloud (5 scanners –multiple scanning engines) to quickly find any suspicious files. Force Breach mode for terminating non-essential processes, malware included. Thank you for this and do count me in! It’s great that one can use Hitman without having to disable other AV software. A superb “second opinion” piece of software. nice software,thanks for the opportunity to win a license,count me in, TY! participate in the contest I hope I get lucky enough to win! 2 Minutes for a standard scan is really fast, and with all those malware engines that it has I don’t see how it can miss any virus. I would like to join tihs giveaway. Thanks for setting up these giveaways. Thanks Martin. Hitman provides a very good 2nd line of defense. I would like to participate in this giveaway. Please count me in. very fast and very good second opinion software, using the free version, hope I can win! I am interested in the HitmanPro license. This software would help me in keeping my computer clean from malware. Enter me for the Giveaway. Thank you! HitmanPro has been in my systems for the past year and I came to depend on it as my 2nd opinion scanner. Ability to scan at a boot time. HitMan Pro is a must have and a gem of software. Force Breach mode for terminating unusual/undesirable processes and the likes and now Kickstart! Thank you Martin and Surfright for the excellent Hitman Pro giveaway. I would love to have a license which will remove malware if found on my system(everything is clean for now). I hope to win .. Very good program as a complement to antivirus. Hitman Pro 3.6 cleared up an infected computer I was working on when nothing else would work. I was highly appreciative of this software for saving me from further hours of frustration. I’m very much looking forward to seeing what miracles version 3.7 can do! I’ve heard only good things about G Data & Emsisoft, so having them together in this new program sounds just about perfect! There is no anti-virus program that gives one hundred percent sure that your computer has been infected. If your computer behaves strangely and antivirus does not show anything, use HitmanPro. Thanks for the giveaway. Sorry for my english. I’m using google translator. Awesome giveaway! count me in too. it is fast and efficient. really. its on par if not better than malwarebyte when come to detecting threat. count me in too for this great software! Nothing beats a second opinion! Please count me in on this great software. Thanks for this giveaway. great software and i knew it becasue i been using it for one year already until i stop 2 month ago as i do not renew my license. think would be a great chance for me to grab a copy here. thank again ghack for another great giveaway! awesome giveaway thank in advance for organizing this great and rare software giveaway. count me in too and good luck all! Thanks for the giveaway, Martin! great security program. but take note that hitman pro alone wil not do the job as it only act as an extra security so do not relies on hitman pro only. a good combination would be malwarebyte and also hitman. Hey Ghacks! Love your site, and love your giveaways. Hopefully, I’ll be lucky enough to win a license. As the local techie for all family, friends, coworkers, and all of their family/friends/coworkers, I love to/need to get my hands on solid anti-malware software so I know what to use when I inevitably get that call. Keep up the great articles! Best second opinion scanner there is! Great at removing rootkits and a fast behavioral scan. Excellent support as well. Like in medicine, it is better to have a second (or even a third) opinion. It looks like we now have such a facility. I would like to win a license! Last time I tried Hitman Pro it worked great, but the trial expired, so currently I’m just using MSE (on-access scanning off). dear santa, you know too well i deserve this giveaway. thank you very much. I have personal experience of Hitman Pro saving me from re-installation when many other anti-malwares and anti-viruses were failing to delete a virus. So I would very gladly take this chance to win a license for it. Thanks. Very good extra protection system. This would be a good addition to my security. Very good second opinion scanner, several anti-virus engines ensures high efficiency, and through the use of cloud computing is very light. Thanks for the contest! This sounds awfully good to miss. Count me in. Such a Great Giveaway. Thank you Sir. This Hitman Pro was great to clean my infected system, 3 month ago im using this Hitman when my system infected by fake antivirus (forgot the name and) and the fake antivirus shut my ESS 5 down, when superantispyware and malwarebyte couldn’t clean it up, i tried using Hitman Pro (trial version), this Hitman Pro cleaned the fake antivirus completely, the super fast and cloud scanning is the greatest (not slowing down my system at all), no doubt. So I would like to win this Hitman Pro protect my system from the fake antivirus or any malware that can harm my system. i have tried the free version in the past. seemed to work well. would like to try the pro version. thanks. I am totally flabbergasted of this nice software ! I am looking forward to use it ! You can count me in ! 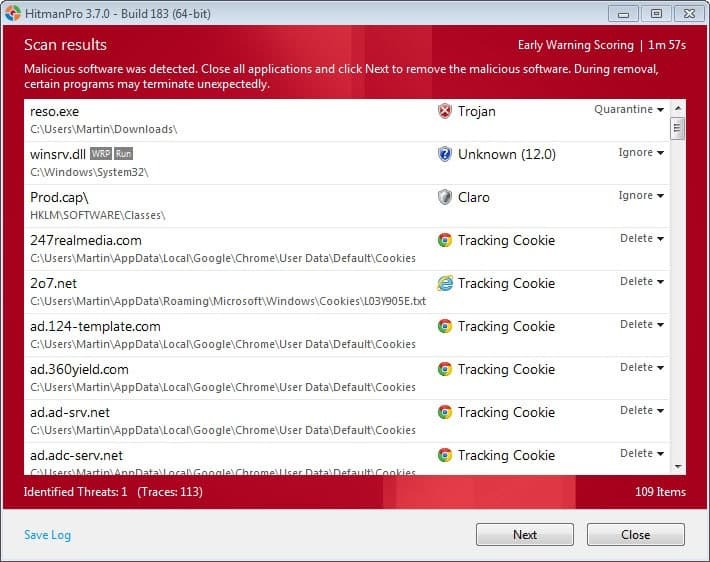 The idea of combining a few malware engines in one program appears to be really nice. We all know one single A/V won’t detect everything (this can be checked by sending a file to services like VirusTotal and watching the results…), so relaying in more than one engine to detect malware would surely increase the detection rate over traditional A/V programs. I am currently using only the built-in firewall in Windows 7, along with Microsoft Security Essentials, so I could have use for such a software! Plwase Count Me In, Martin! that had Hijacked my browser that I found no other way of deleting. This will be an essential addition to my PC. Please count me in. I was so hoping you would have this as part of your Xmas giveaways! So please count me in! Thank you, Martin! Thanx for this giveaway, Martin Brinkmann. interesting, wil give it a try. and thanks for the giveaway! The sophisticated Behavioral Scan inspects files using characteristics like file entropy, activity, communication with servers, compression and encryption. This is being backed by the excellent multiple AV engines, providing great detection, utilising the power of the cloud. It’s hard to look past the fast scanning and, the active community and the dedication of the developers. Force Breach mode, the ability to upload samples to VirusTotal and the newly introduced anti-ransomware feature are also worth mentioning. Thank you for the opportunity to participate in yet another great giveaway on Ghacks. Hi! Hitman Pro is a great cloud scanner with 5 antivirus bases! Thank you for the giveaway. Excellent software, I use it a long time (free). HitMan is so fast and effective. I’ve always wanted a free license to hitman pro! Wow, great giveaway ! ! ! HtmanPro is the best On-demand scanner on the market.. I would love to have a full license for this awesome antimalware scanner.Thank you for the opportunity Martin! I’d like to have one of those free copies. Looks like the perfect backup to my first line of defense. I’d like to win a license for my son’s laptop. an excellent scanner to search for viruses and removing them. I would like a copy of Hitman Pro. I like the sound of the extra protection. I’ve heard good things about Hitman Pro and would like to be in the chosen 10. Thankls for the give away. This sounds like a great program to have. Thanks for offering the giveaway! Looks like a great competitor to Malwarebytes and SuperAntiSpyware! Is it possible to make this a portable app? Everyone could use alittle more protection !!! I already tested the trail version and it’s really good. Give me the license key. WOW:.. hitman PRO. It should be a dream to have it. Please, Martin… Count me in this giveaway. And thank you for this other review! HitManPro is a gem of security software. I would like to win Hitman Pro because it will provide additional protection for my pc and complement my antivirus program for extra security.Great software, count me in, please. On of the best when it comes to cloud scanning. I would love to have a license.. I am actually their translator for greek. A great little application particularly the kickstart feature for sorting out those machines infected by ransomware. Martin,thanks for your awesome site!!,. i have been using hitman pro for awhile now! !,.i loved it then and love it now! !..after the trial period expired,i was never able to really afford a license!,.great product!! Been using it for long long, to me it is the only malware checking needed, nononsense. This is a great tool to clean infected systems. I’ve use HitManPro a couple of times in the past when I felt the need for a secondary scan, and one time it cleaned up a virus that was causing problems. It is a good program to keep handy – you never know when you might need a second opinion (or fix). Thanks gH!!! Any Hitman Pro offer is a super gift!!!! Looks good. it caught 50 Tracking Cookies and 4 (known) trojans. Please enter me in the drawing. Thanks martin for the amazing giveaway count me in for the superb and ultimate malware scanner . Count me in please. thanks. great giveaway. One of the best malware removal tool I ever used so far.. highly recommended! Thanks for the Hitman Pro reviews & giveaway. Hopefully can win 1 license of the fantastic supplimentary protection then. hitman pro is a great software.add me also. I currently use this as my third opinion scanner behind Malwarebytes. Manual scans kicked off via task scheduler any time someone logs in. Hopefully it doesn’t find anything though because it’s the free version! This is without doubt the best on-demand scanner. I have used the trial of this and Please count me in on this nice giveaway. When will we know who won the 10 licenses? Great Software. The best malware removal tool. Viva Hitman Pro. Add my name to the list of those who’d like a copy. Great program.